This Halloween, brace yourself for a 5K dash that will set your heart-racing faster than you can run. Standing in your way, every corner and every turn, will be hordes of zombies waiting to grab a hold of your beautiful faces to tear them open and consume what’s beneath. The apocalypse is closer than you think, and if you think all you’ve got to be is fast, you’ve got another thing coming. Runners will have to maneuver and traverse a string of obstacles that makes “challenging” sound like a walk in the park, at the same time having to dodge and outrun zombies awaiting their next meal. Make your way to The Fort, the last remaining safe haven that is quarantined and kept safe from the zombie hordes. Armed military personnel will be waiting for you at the gates to ensure your survival, but getting there is the challenge. Runner tickets for Day 1 sold out in 14 hours. Due to overwhelming requests, Race The Dead added one more day. 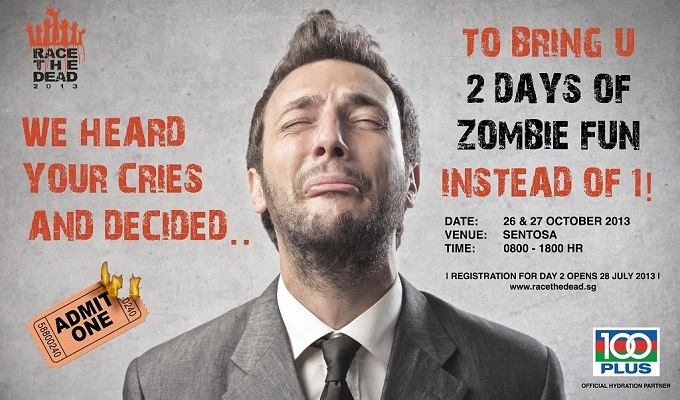 All Zombie volunteer tickets for both days already sold out. Get your ticket now before they are all sold out again! 1 – At the start of the race, runners will be issued 2 red flags simulating their lives. The goal of the race is to reach the finish line with at least 1 red flag left to qualify for placing. 2 – The entire course will be infested with at least a 100 zombies (based on intel) and runners are to avoid contact with them at all cost. 3 – Expect obstacles along the way and take extra precaution clearing them, remember there’s more than one way to die. 4 – Need help surviving the race? Look out for a medical outpost in the course, should you need to replenish a lost health flag. 5 – Upon reaching the finish line, runners are required to move to the “Quarantine Area” for military personnels to determine if they are infection free. 6 – Join other racers and the undead for a rocking good time after your run, as we line up an entire day of live performances and exciting activities. Day 1 Registration Opens on 10 June 2013. Day 2 Registration Opens on 28 July 2013. All zombie volunteer tickets sold out. 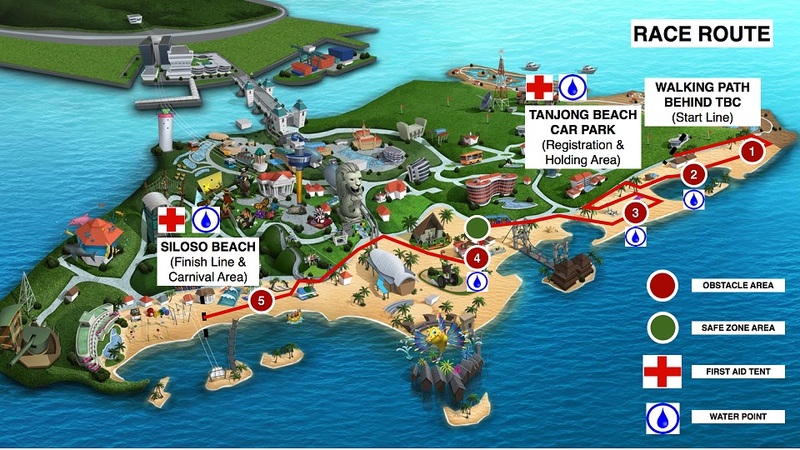 Tickets can be purchase online from 10 June 2013. 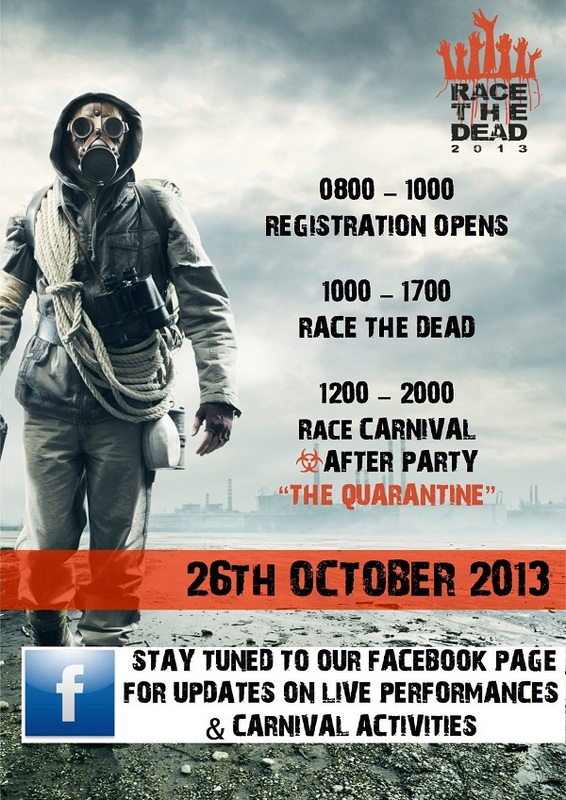 For further information and to buy event tickets, visit Race The Dead website.